The Sportster™ Modular Weapons Case by Blackhawk!® (product no. 74SG04BK) is an affordable solution for those needing to safely transport firearms to and from the field or range. The bag measures 36 inches long and is capable of carrying up to two firearms. 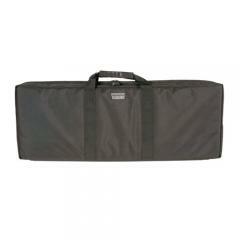 A padded divider separates the bag into two compartments, or it can be removed to accommodate one larger firearm. The smooth inner lining protects the weapons' finish from scratches. A full set of pouches allow for ample storage room of additional shooting accessories. The dual-density foam design features open-cells next to the firearm and closed-cell cushioning facing away to absorb impact while further safeguarding firearms from damage. The bag itself is made from tight-weave, 600 denier polyester and coated in a thick PVC laminate for extra strength and effortless maintenance. The handle's unique wraparound design incorporates added tactical webbing for maximum versatility and provides balanced support of the weight load. MOLLE or Speed Clip™ compatible exterior webbing serve for convenient attachment of additional accessories and equipment. Self-healing, oversized coil zippers with dual pulls keep contents secured. The Modular Weapons Case includes a muzzle retainer (model no. 74MR00BK #7) and a set of weapons retainers (model no. 74WR00BK #5). Dimensions (L x H x D): 36" x 13" x 5"